Based on analyses of satellite imagery, SVERT reported that on 26 August a gas-and-steam plume possibly containing ash rose from Berg (part of the Kolokol Group of volcanoes) to an altitude greater than 6 km (19,700 ft) a.s.l. and drifted NE. Weak gas emission from the extrusive domes at Berg and Trezubetz was noted during a 6 November overflight. Five explosive eruptions and one dome-building episode are known between 1845 and 1970. Very weak gas emission was occurring from the summits of extrusive domes at both Berg and Trezubetz during the 20 September 1981 flight. 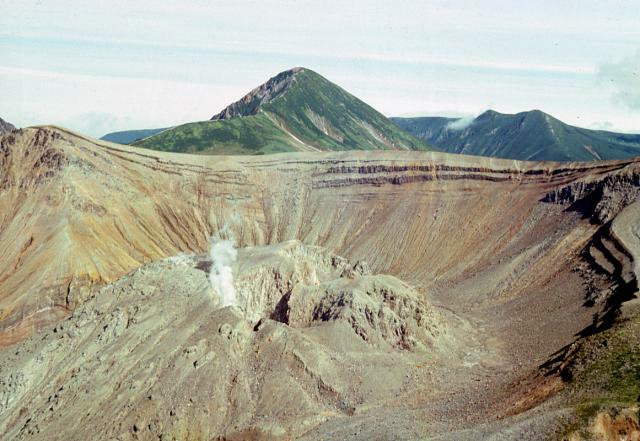 A group of Holocene volcanoes in central Urup Island is named after its most prominent volcano, Kolokol. Berg and Trezubetz volcanoes, flanking Kolokol on the NW, have breached summit calderas partially filled by lava domes. Trezubetz, whose name means "Trident," has an eroded crater rim with three large peaks when seen at sea from the north. Kolokol rises to 1328 m and is sometimes known as Urup-Fuji because of its symmetrical profile. The crater of Kolokol is not well preserved, but there is no evidence of glacial erosion. Several lava flows originate from Kolokol; one of these extends almost to the Sea of Okhotsk coast; a viscous lava flow armoring the SE flank is probably the most recent. Borzov volcano, the oldest of the group, lies to the SW of Kolokol. Eruptions of the Kolokol group have been observed in historical time since the late-18th century. 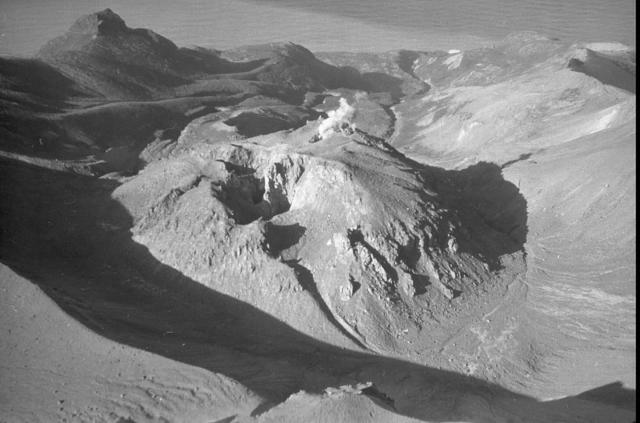 Berg volcano has been most active, but Trezubetz erupted in 1924. 1894 Jul 25 1894 Jul 26 Confirmed 2 Historical Observations Berg ? There is no Deformation History data available for Kolokol Group. There is no Emissions History data available for Kolokol Group. Berg volcano, seen here from the SE, is part of a closely spaced group of Holocene volcanoes in central Urup Island that is named after its most prominent symmetrical volcano, Kolokol. Berg, which has a 2-km-wide caldera breached to the NW that contains a large lava dome, is the most recently active of the group. Steam rises from an explosion crater on the NW side of the 250-m-high lava dome and a prominent explosion crater (center) cuts its southern side. Eruptions of Berg have been documented since the late-18th century. Photo by A. Samoluk, 1990 (courtesy of Genrich Steinberg, Institute for Marine Geology and Geophysics, Yuzhno-Sakhalinsk). A steaming lava dome partially fills the breached summit caldera of Berg volcano, with conical Kolokol volcano in the background to the south. They are part of a group of Holocene volcanoes in central Urup Island that is named after its most prominent volcano, Kolokol. Berg and Trezubetz volcanoes, flanking Kolokol on the NW, have breached summit calderas partially filled by lava domes. Kolokol volcano rises to 1328 m and is sometimes known as Urup-Fuji because of its symmetrical profile. Photo courtesy of Alexandr Rybin (Institute of Marine Geology and Geophysics, Yuzhno-Sakhalin). Large Eruptions of Kolokol Group Information about large Quaternary eruptions (VEI >= 4) is cataloged in the Large Magnitude Explosive Volcanic Eruptions (LaMEVE) database of the Volcano Global Risk Identification and Analysis Project (VOGRIPA).